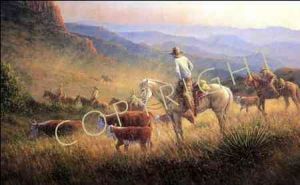 The rugged Davis Mountains of West Texas are the backdrop as these cowboys gather the last of the cattle before sundown. This day began some 12 hours earlier as we left camp to round-up more than 800 head of cattle to be worked and shipped by early fall. Hot, tired and dusty, all of us looked forward to our arrival at the pens and the "End of a Long Day."